the United Nations regarding economic sanctions against Iraq. potentially be used for either civilian or military purposes. the new sanctions policy relieve some of the suffering of Iraqi civilians? And as a consequence, shouldn't the vote be considered a step forward? Isn't any "humanitarian" reform of the sanctions better than nothing? fairly complicated war strategy by the Bush administration. moment the Bush administration is preparing for all-out war on Iraq. all countries--it would mean an end to the so-called Oil for Food Program. This is a UN program that is dominated by the United States. permitted Iraq to resume selling oil for the first time since August 1990.
of the UN Security Council. The rest went to the Kuwaiti monarchy and other "victims" of the 1991 war. Last year, for example, $200 million of OFP funds was given to ExxonMobil. The Iraqi government resisted the Oil for Food Program for several years. after sanctions had brought the economy to its knees. to diarrhea, pneumonia and malnutrition." had little choice given the raging sanctions-induced genocide of 1991-1996. Will there be additional civilian goods available to the Iraqi population? listing of all the commodities that could be still banned as "dual use"
purification, x-ray machines, all computers, etc. to massively bomb Iraq and invade the country with ground troops. resolution essentially denounced the move. ambitions to replace the Iraqi government with a puppet regime. : Now the US and Britain get to set how much the Iraqis charge for their oil. Can it get any more obvious??? : "Smarter" Sanctions: Quite oily ....: : : http://www.workers.org/ww/2002/iraq0530.php : Behind Bush's Maneuver at the UN : By Brian Becker : It is essential for progressive people, and especially the working class : whose sons and daughters constitute the majority of the Pentagon military : forces, to understand the real politics behind a recent U.S. initiative at : the United Nations regarding economic sanctions against Iraq. : The UN Security Council voted unanimously May 13 to reorganize the economic : sanctions on Iraq. : The major media in the United States reported that the new sanctions would : be "smarter" because they will supposedly permit Iraq to import many : previously banned goods that are essential for the well-being of Iraqi : civilians. : After the UN vote, Bush administration officials raced to the microphones : to declare that if civilians continue to suffer they will have only Saddam : Hussein to blame. They asserted that the new sanctions only prohibit Iraq : from receiving military goods or "dual use" products--goods that could : potentially be used for either civilian or military purposes. : Part of a war strategy : Does the UN decision usher in a new era of "smarter" and more humane : economic sanctions? Having lost more than 1 million people to disease and : malnutrition as a result of 12 years of virtually airtight sanctions, won't : the new sanctions policy relieve some of the suffering of Iraqi civilians? : And as a consequence, shouldn't the vote be considered a step forward? : Isn't any "humanitarian" reform of the sanctions better than nothing? : This, unfortunately, has been the position of some groups and leaders in : the anti-sanctions movement. : The May 13 UN vote was not humanitarian at all. It is actually part of a : fairly complicated war strategy by the Bush administration. : The real reason the United States initiated the new sanctions with a "human : face" was to prevent the actual complete lifting of sanctions at the very : moment the Bush administration is preparing for all-out war on Iraq. : If sanctions were entirely lifted--which is the official position of almost : all countries--it would mean an end to the so-called Oil for Food Program. : This is a UN program that is dominated by the United States. : The program allows the United States, rather than the Iraqi government, to : exercise strategic control over Iraqi oil revenues. The Bush administration : considers this program a central element in its favor as it prepares for : war against Iraq. : The OFP purports to be a humanitarian enterprise. The Iraqi government : agreed to it in 1996 after having rejected it for several years. The OFP : permitted Iraq to resume selling oil for the first time since August 1990. : But the revenues from all its oil contracts were placed under the control : of the UN Security Council. : Of course, this scheme was a thinly veiled form of looting by the U.S. and : British governments, the Kuwaiti monarchy and many of the biggest Western : corporations. : Between January 1997 and 2000, Iraq sold $40 billion worth of oil. All this : money was deposited into an account controlled by the UN. Only $9.6 : billion, less than 25 percent of the revenue, was distributed to Iraq to : purchase food and medicine. : The rest went to the Kuwaiti monarchy and other "victims" of the 1991 war. : Last year, for example, $200 million of OFP funds was given to ExxonMobil. : The corporation was listed among the "victims" of Iraq's 1990 invasion of : Kuwait. : Worse still, the Oil for Food Program constituted a major setback for Iraqi : sovereignty and independence. The transfer of its oil revenues to de facto : U.S. control provides the imperialists with strategic leverage at the core : of Iraq's economy. : The Iraqi government resisted the Oil for Food Program for several years. : U.S. conservatives and liberals alike routinely pilloried Saddam Hussein : for rejecting this form of "humanitarian aid." The Iraqis only relented : after sanctions had brought the economy to its knees. : By 1996, economic sanctions had plunged Iraq's relatively affluent society : into stupefying poverty. In April 1998 UNICEF reported, "The increase in : mortality reported in public hospitals for children under five years of age : (an excess of some 40,000 deaths yearly compared with 1989) is mainly due : to diarrhea, pneumonia and malnutrition." : Iraq was well aware that the imperialist powers were unlikely to ever : relinquish control over its oil resources once it accepted the OFP, but it : had little choice given the raging sanctions-induced genocide of 1991-1996. : The May 13 vote for "humane" sanctions is, plainly put, the only available : method to maintain U.S./UN economic sanctions and, as a consequence, the : Oil for Food Program. : Will there be additional civilian goods available to the Iraqi population? : That is a possibility. But the new UN resolution also contains a 332-page : listing of all the commodities that could be still banned as "dual use" : products. In the past this criterion has led to banning ambulances, : chlorine, piping, pumps and filtration equipment used in water : purification, x-ray machines, all computers, etc. : Even if it turns out that Iraq is able to import more goods, however, that : is not the decisive issue for the Bush administration. The Bush : administration and the Pentagon have made it clear that they are preparing : to massively bomb Iraq and invade the country with ground troops. : No war for Big Oil : Maintaining the Oil for Food Program is part of the Bush war strategy. If : Iraq had sovereign control over its own oil it would undoubtedly use the : funds derived from the sales to rebuild its economy and infrastructure and : to prepare to defend itself against the Bush administration's planned : aggression. : In this context, the May 13 UN vote is not a humanitarian step forward. It : actually assists the U.S. war effort against Iraq. Even the countries that : succumbed to U.S. pressure--including threats, no doubt--and voted for the : resolution essentially denounced the move. : The Russian and Syrian ambassadors, for instance, called for the full : lifting of the sanctions--immediately after they voted for the U.S.-backed : resolution. : If the United States has its way, in the coming months thousands of its : soldiers will be sent to kill and be killed to fulfill imperialist : ambitions to replace the Iraqi government with a puppet regime. : It is not about "weapons of mass destruction" or getting a more democratic : government in Baghdad. : It will be a dirty war for oil. 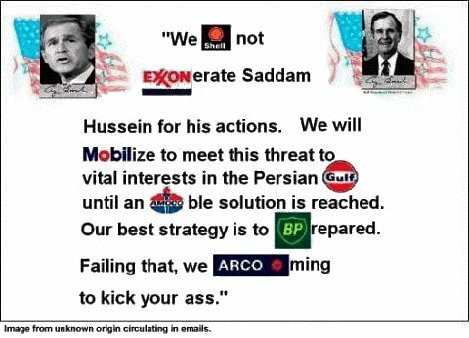 A war for ExxonMobil, Texaco, Citibank, : Chase and the corporate capitalists who are hell-bent on returning Iraq to : its former colonial status. : ------------------------- : : Now the US and Britain get to set how much the Iraqis charge for their oil. Can it get any more obvious?? ?